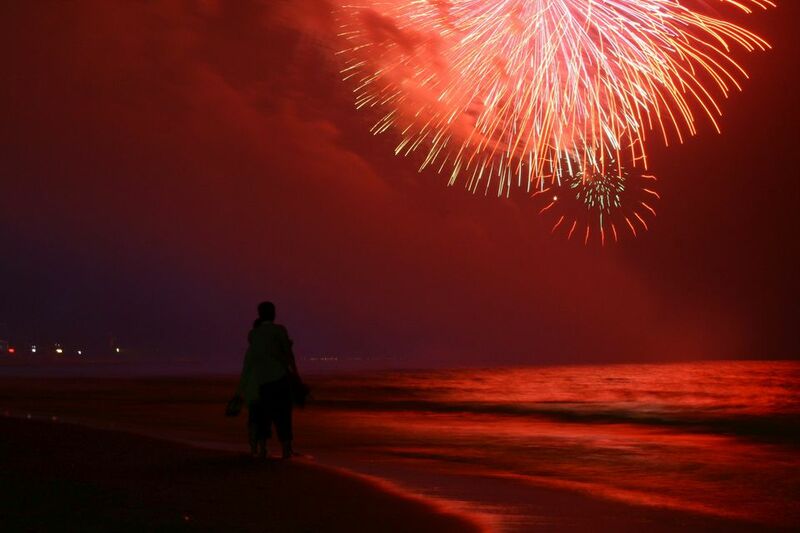 Ocean City, Maryland is a spectacular place to see fireworks at the beach! Fireworks displays are held several times a year and are great fun for the whole family. Bring a blanket, relax and enjoy the colorful pyrotechnics under the stars. Keep in mind that these events are popular and attract large crowds. Parking is limited and can be challenging, so be sure to arrive early to stake out a good spot. The buses are crowded too, but are the best way to get around. Be patient and have fun! To learn about places to stay, things to do and more, see An Ocean City, Maryland Visitor's Guide. Here you can see a map of Ocean City, MD. July 4th Concert and Fireworks – July 4, 2016, 8-10 p.m. Two Locations! N. Division Street. Oceanside Boardwalk (Inlet - 27th) Ocean City, MD. Fireworks will be visible along the boardwalk. Celebrate Independence Day with a free concert, followed by fireworks at 9:30 p.m. on the beach. Parking: The new Park and Ride located on Route 50 just west of the Harry Kelley Memorial offers 710 parking spaces. You may also try parking between 15th Street and 28th Street, and taking the Boardwalk Trolley south to Caroline Street. There is also parking with access to the bus at the Ocean City Convention Center (40 St.
and Coastal Hwy), Public Safety Building (65th Street), Ocean Plaza Mall (94th Street) and the Ocean City Municipal Parking Lot (100th Street on Coastal Hwy) and Gold Coast Mall (112th Street). Bus service is available all day for $2. Northside Park at 125th St. Ocean City, MD. Celebrate the holiday with a concert and fireworks on the bay side in North Ocean City. Parking: There are many side streets near the park. Expect to walk several blocks. Taking the bus is a good alternative. See the parking locations above. For more information about Ocean City's 4th of July celebrations, call the Ocean City Public Relations Office at (410) 289-2800; the Ocean City Recreation & Parks Department, (410) 250-0125; toll-free 1-800-OC OCEAN. Summer Beach Fireworks – Mondays and Tuesdays, July 11 - September 3, 2016, 10 p.m. N. Division Street Beach, Oceanside Boardwalk (Inlet - 27th) Ocean City, MD. Each show is approximately 8 minutes in length and begins at 10:00 p.m. Fireworks will be visible along the boardwalk. Dates: July 11, 12, 18, 19, 25, 26, August 1,2, 8, 9, 15, 16, 22, 23, 29, 30 and Sept. 3. Sundaes in the Park & Fireworks – Sundays, July 10-September 4, 2016, 9 p.m. Northside Park, 127th Street. Ocean City, MD. The free family concert series on Sunday evenings in July and August are held from 7-9 p.m. For a small fee enjoy your own ice cream sundae creation as you listen to your musical favorites and watch the sunset over the beautiful Assawoman Bay. The show concludes with a fireworks display. New Year's Eve Fireworks - December 31, 2016, midnight. Northside Park, 125th Street: Bayside North Ocean City (91st - 146th). The Town of Ocean City hosts a New Year’s Eve Fireworks Show to ring in the new year. The show will be accompanied by live entertainment, warm hot chocolate, and the opportunity to ride through the Winterfest of Lights, a display of more than one million holiday lights sparkling throughout Northside Park. Looking for more things to do in the area? ​Here you can see a Guide to Annual Events in Ocean City.